Nov. 21, 2017 -- Nearly half of cancer cases in the U.S. may be preventable, according to a new study. Some things that raise your risk of cancer are out of your control, like whether your parents had cancer. Others you can avoid, like smoking, eating red meat, and too much sun. 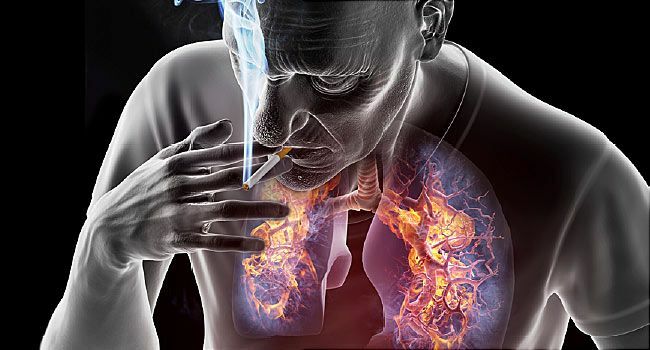 Of the things you can avoid, smoking, drinking, and a poor diet continue to be among the top causes of preventable cancer cases, says Ann Goding Sauer, an epidemiologist at the American Cancer Society and a researcher of the study. Nothing in the new report will be surprising to those who study patterns and causes of disease in humans, Goding Sauer says, as previous research has also found a high percent of cancer cases and deaths linked to these risk factors. But the new report does build on decades of research on risk factors for specific cancers, says Otis Brawley, MD, chief medical officer for the American Cancer Society. He calls the new study ''the most extensive review" to date. And it is a call to action for people to change their health habits if they want to lower their chances of getting cancer, he says. 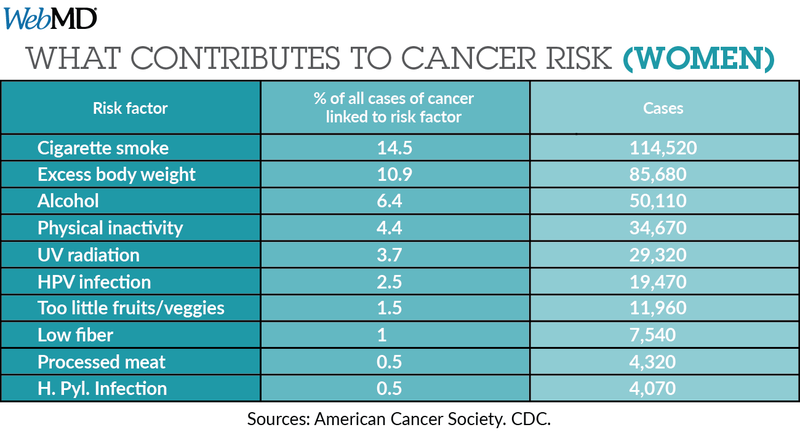 The team calculated that 42% of all cancer cases (or more than 659,000 of more than 1.5 million cases) and 45.1% of deaths (or more than 265,000 of 587,000) were linked to preventable risk factors. Cigarette smoking was linked to the highest percent of cases (19%) and deaths (28%). Body weight was next, accountable for about 8% of cases and 6.5% of deaths. Alcohol was linked to 5.6% of cases and 4% of deaths. Some risk factors affected cancers in men more than in women, Golding Sauer says. "For example, smoking rates are historically higher in men than women," she says, so it was not a surprise that cigarette smoking accounted for more than 23% of all cancers in men but 14.5% of cancers in women. Other risk factors played more of a role in women's cancers. Extra weight was linked with twice as many cancers in women as in men, 10.9% vs. 4.8%. Too little exercise accounted for more than 4% of cancers in women, but just 1.5% in men. Overall, more than half of cancer cases were linked to potentially changeable risk factors for 15 of the 26 cancer types studied. Although cancer rates have declined, 1.6 million new cases are expected this year, with 600,000 deaths in the U.S.
"I think the findings of the report are largely accurate and not surprising," says Edward Giovannucci, MD, ScD, professor of nutrition and epidemiology at the Harvard T.H. Chan School of Public Health. He reviewed the findings but was not involved in the study. "A large proportion of cancers are potentially preventable," he says. "Even with just what we know, about half of cancer mortality is preventable. Of course, there may be more [as yet] unidentified factors." For that reason, Giovannucci says, ''it may make sense for us to put more emphasis on preventing cancers that we know are preventable,'' and doing more research to find additional risk factors. While the study’s researchers call for such measures as taxes on cigarettes to decrease smoking rates and more emphasis on vaccinations against HPV and hepatitis, there is also much people can do to lower their risk, Brawley says. Top of the list, of course, is to stop smoking. "It's the biggest driver," he says. About 15% of U.S. adults smoke, the CDC estimates. After smoking, Brawley says, the biggest three are "too many calories, not enough exercise, and obesity," Brawley says. 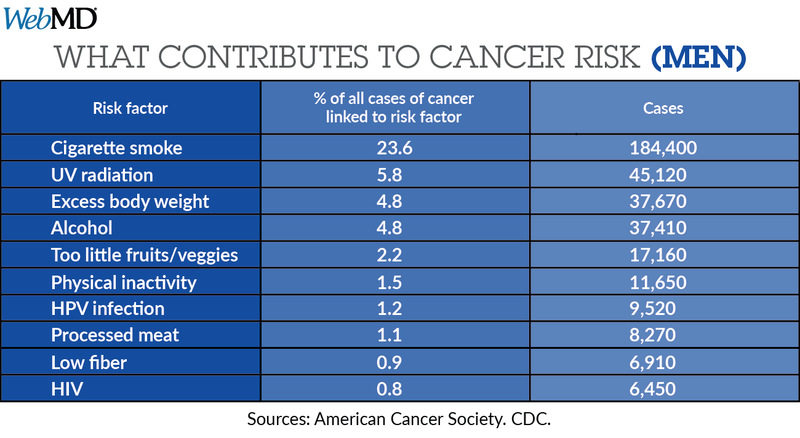 "Diet, exercise, and weight are the biggest factors that people can modify to lower the risk of cancer, other than smoking." As for diet, he says, "up the grains, fruits, and vegetables" and don't drink too much alcohol. While the emphasis on cancer screenings with mammograms and other tests to find cancer early should be ongoing, Brawley says, ''Hopefully we can light up the emphasis on prevention a little more." F. Islami, CA: A Cancer Journal for Clinicians, Nov. 21, 2017. Ann Golding Sauer, MSPH, epidemiologist, American Cancer Society. Otis Brawley, MD, chief medical officer, American Cancer Society. Edward Giovannucci, MD, ScD, professor of epidemiology and nutrition, Harvard T.H. Chan School of Public Health. CDC: "Current Cigarette Smoking Among Adults in the U.S."